Members of Glenn Beck's army demonstrate just how clueless they are. You know, I think they're talking about income tax. There will always be corporate taxes and there should be. It's funny, but no matter how many liberal blogs I read, all I see is name calling and an actual ignorance of what conservatives are talking about. Here's a clue for you: we don't listen to soundbites. We listen to the whole conversation. Perhaps if you engaged in this conversation, you might see what we're talking about and actually realize what we have in common. But if you make a ton of money & don't mind paying stupid amounts of it to a government that employs the likes of ACORN to take our census, you're more than welcome to do that. Anyone who post an 'anonymous' comment ought to be disregarded anyhow. When they have no idea what they're talking about, they should be ignored altogether! 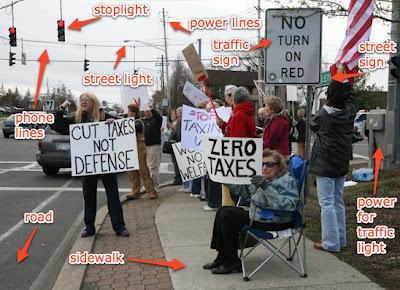 Anonymous(2), the older woman (who is probably on Medicare) clearly has a sign that says ZERO taxes. The picture shows several concrete benefits of taxes (including income taxes). Therefore I stand by my statement that she is clueless. Meanwhile if you truly want people to be "engaged in this conversation" then you have a lousy way of opening a conversation by leaving an insulting anonymous comment on my blog. I'm think I'm going to start a whole series on this- inspired by the Great Wabi Sabi. Social welfare: police protection, roads, bridges, highways, etc. All paid for by the public dole. Don't like public assistance? Well, get out there this winter after a big snow storm and shovel your own damn way to work instead of laying around on the couch waiting for your government handout. I look forward to your series. I suggest including something about those socialist "public" restrooms that have infiltrated nearly every community in WV. People should have enough personal responsibility not to rely on government for their toiletry needs. Right?